New USW members are always welcome. Meetings are held the last Tuesday of every month starting at 12:05 pm in the Union Office Boardroom (excluding July, August and December). USW members are welcome to attend. 2010-01 members (Academic Assistants) are compensated for their time serving on Joint Health and Safety Committees. As per Article 17.03 of the Collective Agreement, 2010 members “will not suffer a loss of regular straight time pay for time spent attending meetings of the Committee or carrying out duties as a worker representative.” Meetings and inspections are conducted during regular office hours. Please email: liza.cote@usw2010.ca if interested in any of these opportunities. Our union is committed to preventing injuries, illness and death at the workplace. Please visit www.stopthekilling.ca to learn more. Our members reflect the diversity of Canada. We celebrate differences and believe that everyone is entitled to a workplace that is free from discrimination, regardless of race, religion, gender, age, status or sexual orientation. Our union helped achieve legislation and regulations that provide for equal pay, anti-harassment protection and employment equity provisions. Does pay inequality really get you down? Do you want to be part of the progressive movement to bring about equal pay for work of equal value? The Equal Pay Day event occurs on campus yearly in consultation with the Job Evaluation Committee, Women of Steel Committee, and other groups on campus. Meetings are as required including 1 post-event meeting. The Working Group on Job Evaluation (WGJE) recommended in June 2016 new job evaluation tools. In December 2016, Queen’s University and USW Local 2010 approved the recommended tools, which will form the main components for building a new job evaluation system. The WGJE continued to meet in October, November, and December to review the timetable as set out in the collective agreement and to prepare for upcoming project activities. The WGJE met again in January 2017 and will continue to update the community as the project progresses. The Equal Pay Day event occurs on campus yearly in consultation with the Job Evaluation Committee and other groups on campus. 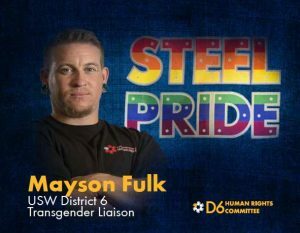 The United Steelworkers are committed to equality. We believe unions need women and women need unions. We have strong policies against harassment in the workplace, bargain for pay equity and offer training and leadership development to our women members. All women who are members of the Union are considered Women of Steel.